Visit us on the Ametek booth at EMCR 2018 (Electrochemical Methods in Corrosion Research) on 22-27 July 2018 at Robinson College, Cambridge. Blue Scientific is the official distributor for Ametek electrochemical testing systems in the UK and Ireland. For more information about the product range, please get in touch. EMCR is an international conference about corrosion electrochemistry, held in various countries since 1982. The single-session format means you can catch all the presentations and not miss out on anything. The whole event is held at a single venue along with social events and accommodation, giving you plenty of time to get to know others in your field. The date of this event has now passed. For upcoming events, see our Events page. High temperature electrochemical studies eg pressurised water or molten salts. Scanning and microprobe techniques, including scanning probe, SECM, LEIS and techniques based on AFM. Electrochemical studies of environmentally-assisted fracture. Detection of hydrogen and hydrogen interaction with metals. Modelling from the atom to the application. Combining electrochemical studies with complementary techniques (eg optical, ultrasonic, radiographic, tomographic). Papers submitted to the meeting (oral presentations and posters) may be submitted to a special edition of a technical journal (details to be confirmed). Please indicate on the registration form if you would like to submit a paper, and the organisers will be in touch when the abstract is due. Come and see us on the Ametek stand and find out about their range of potentiostats and electrochemical testing systems from Solartron Analytical and Princeton Applied Research. 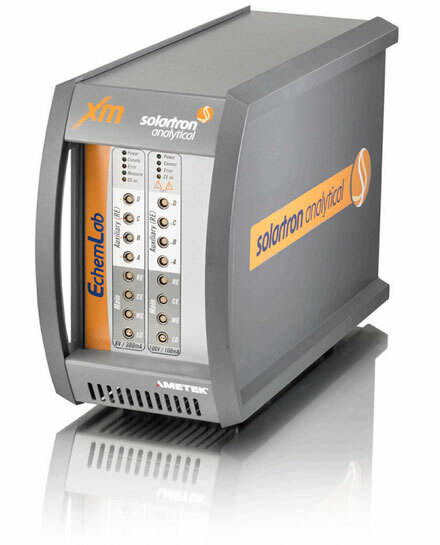 Solartron EchemLab XM – Small footprint system specifically for corrosion research and electrochemistry. Solartron Modulab XM ECS – Market-leading impedance analysis, with the widest voltage and current range available. VersaSCAN scanning system – Local information about electrochemical events on the sample’s surface eg pitting, scratch tests, topography. Corrosion cell kit – Used in labs worldwide for corrosion testing. If you have any questions or if you’d like more information, please get in touch.